But that’s old news. What’s new news is that the Visa credit card ban has just been extended to an additional 142 food stores and 108 fuel centers across seven states. Now, Visa, Inc. isn’t exactly a small company. Each year, Visa processes more than 100 billion transactions, about $6.8 trillion worth. When you’re that size, the opting out of 19 stores might not so much hurt as tickle. But when the ban grows to another 142 stores with 108 fuel centers, it might at least begin to itch. Especially if the 19, 142, and 108 belong to the largest supermarket chain in the United States, which owns and could extend the ban to some 3,000 more stores. By “largest supermarket chain in the United States,” I refer to The Kroger Co. Itself no small player, Kroger operates across 35 states with 2,764 retail food centers under various banners—Kroger, Smith’s, Ralph’s, Food 4 Less, Fred Meyer, Dillons, Fry’s, and 18 others, give or take, as of this writing. 2,270 of these properties sport a Kroger-owned pharmacy, and 1,537 sit adjacent to a fuel station. Kroger also owns 253 fine jewelry stores and 38 food manufacturing and production companies. The above-referenced 142 stores and 108 fuel centers operate under Kroger’s Smith’s Food and Drug banner. In fact, it was Kroger’s 1999 acquisition of the by-then merged Smith’s and Fred Meyer stores that rocketed the company to the top of the U.S. retail grocery heap. All of which is to say that The Kroger Co. is of sufficient size that the ban must surely have gained Visa’s attention. And Visa must surely have considered that if Kroger prospers without the card, other large retail chains might be tempted to follow suit. Note the “all forms of payment except Visa credit cards” part. Smith’s and Foods Co. stores will continue accepting other credit cards, including Kroger’s own cobranded Kroger REWARDS World Mastercard, and Visa debit cards. Whether that proves confusing to consumers remains to be seen. Not having the option of using a Visa credit card could be viewed as a big enough inconvenience to drive shoppers away, analysts say. The trend in the industry, of course, is a shift away from cash payments to electronic transactions. As I tell my undergraduate students, whenever they encounter in their required reading a claim or argument that seems just plain stupid, they should probably double check to make sure they are not misreading the “preposterous” passage in question. It is possible that they have uncovered a howling error that has somehow gone unnoticed by the profession for generations, but not very likely. 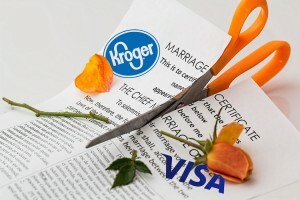 Kroger does not lack for skilled analysts who would have considered whether the Visa credit card ban would backfire. It’s not unlikely that the Foods Co. ban was a test foray. If so, then the extension of the ban to Smith’s would seem to indicate that results have been encouraging. Playing musical credit cards isn’t new. For years, Costco managed just fine taking American Express credit cards, Visa debit cards—but not Visa credit cards. Then, in 2016, Costco traded the American Express for the Visa credit card after all. And, as MarketWatch’s Maria Lamagna points out, Citigroup purchased BestBuy’s cobranded credit card from Capital One in 2013, and Walmart dumped its cobranded Discover card for a cobranded Mastercard in 2014. I see three possible outcomes to the Kroger-Visa stare-down: (1) Kroger capitulates and mends ties with Visa; (2) Visa capitulates and gives Kroger a better rate; or (3) Kroger and the Visa credit card carry on without each other. I know better than to make an attempt at predicting which it will be.